You must make reservations at least 5 minutes in advance of the time at PZA Parlour. PZA is a fun and creative way to use the word Pizza. It is clean, vibrant, with a branded aspect that will be repeatable and a common staple in the restaurant community. As I start my new family and become older and respected, PZA will grow with me, my family, you and your family, and will become the Pizza place that we grew up with (the place our parents took us for a good time). Parlour will play a smaller role yet is key in the name to define the concept of the restaurant. The word "Parlour" being as old as pizza itself is defined as business that specializes in goods and services. The goods and service that I know and specialize in is pizza and tradition. The parlour aspect brings suggestions of my tradition to the restaurant, checkered tables, green carpet, wicker wrapped wine bottles, and my Nonnos passion of creating pizza and making customers feel like family. Food was excellent, some of the best pizza in the city. Waiter seemed disinterested and sullen, only came by to inquire on our food when our mouth was full. Very poor. Love PZA! We had the special seafood pasta and it was fresh and perfectly flavoured. One person had the pizza and she said it was outstanding. Delicious calamari, not all rubbery like some places. Also I recommend the Caesar salad. The wines are very fairly priced as well. Going back for sure. Food was quite good and came out quickly. Would definitely go back. Restaurant decor is lovely, nice atmosphere. The pizzas and calamari were great. Super service. We will definitely go back! 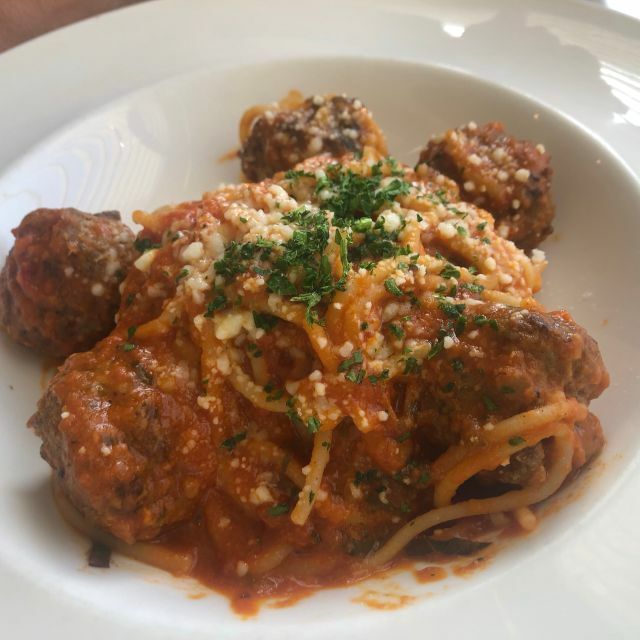 I had only been at PZA once before but knew of their affiliations to the other great Italian restaurants around town (Villa Firenze, Stromboli Inn and Pulcinella). My friends had never been, and driven by on Macleod not knowing what the restaurant was like. Well, after an impressive lunch, our group has no doubt that we will come back again! Fresh homemade pasta done perfectly and fantastic pizza was the highlight of our visit! 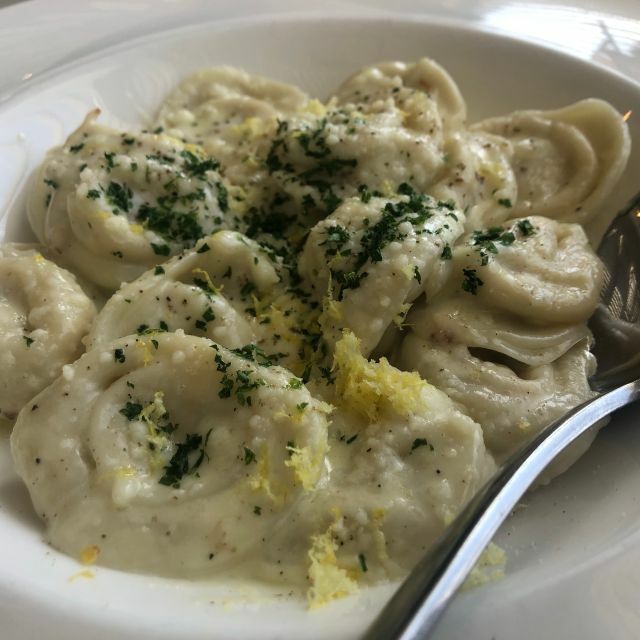 Our host, Luca recommended their special of the day, a beautiful lobster-stuffed tortellini! Two of us got this decadent dish, while others ordered the fantastic Carbonara, Polpette pastas and the PEI Wedding Pizza (more lobster=yum!). 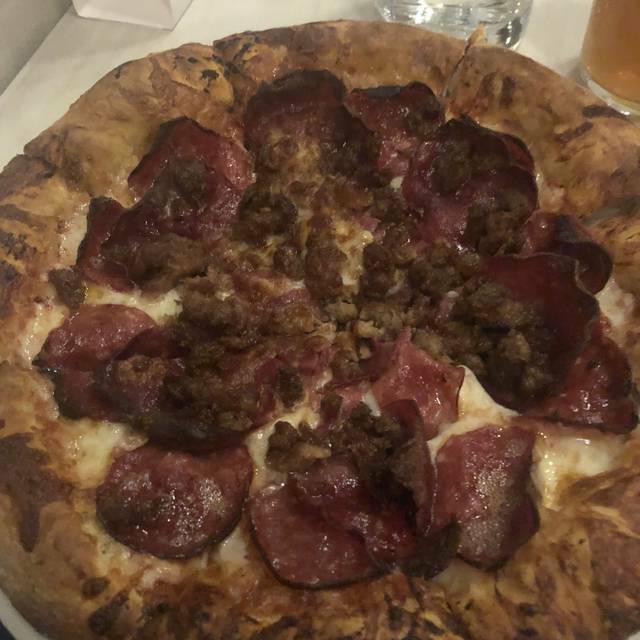 The crust on the pizza had the perfect amount of chew and crispness at the same time! 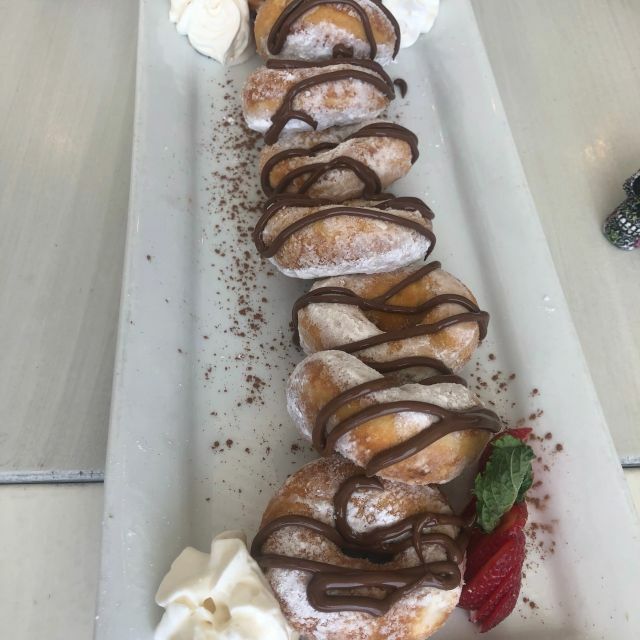 Just when we didn’t think we could eat any more, Luca suggested the Ciambelle Italian doughnuts, drizzled with Nutella. As full as we were, we gobbled those down without hesitation! The atmosphere is warm and welcoming, service was excellent and friendly giving us more reason to come back to PZA again soon! Prices are reasonable for the homemade and fresh ingredients! Fantastic pizza and great service. Cool vibe too! The best Pizza in town !!! And what about their donuts !!! We've been to PZA multiple times since they opened. It is one of the best places to have a decent thin crusted pizza in the SW. Some of their pizza pairings are creative and inspiring while others a perfect execution of the traditional recipies. We've sampled some of their fine dining dishes as well. The scalopinies are well cooked and tasty as well. The dessert dept. is the one that I would recommend reconsidering ordering from. The quality of these dishes is inconsistant. sometimes they are pefect sometimes less. If you have to have a dessert cause you're sweet tooth go with the tiramisu. It has always been perfect. That said, do not let the dessert menu keep you away from an outstanding pizza place. Our server was David and he did an amazing job! Even when my son ordered the Extremely Spicy Tre Diavoli, he was helpful in assisting with milk and advice! Wonderful food! He made our evening even more enjoyable. THANK YOU! The food is always amazing here and the service is excellent. It’s noisy which can be great and lots of fun but when you’re parents are hard of hearing it’s a little difficult. Also the chairs are very uncomfortable, I’ve been a few times and find the high table chairs are better than the low ones. Great food for celiacs! GF crust best in town! Alex was a wonderful server! We were welcomed warmly. Love the decor, the music and the ambiance! Will be bringing other friends back soon! The food was fantastic. Highly recommend the gnocchi with pesto cream. Clean & cute place - awesome pizza & wine. Jessie was a fun server! We will be back soon! First time there, food was awesome, Justin the waiter was great, very knowledgeable. Kids loved it. Not the most inexpensive pizza I've ever eaten. Would definitely recommend. Ordered pasta, it took over 45 minutes to arrive. It was not very hot. Server did not apologize. The portion size was also quite small, especially for the relatively high price. Our server Geoff was great. It was my first time at P|ZA and I cant wait to go back!!! Great food. Great atmosphere. Overall, a great place to eat. They screwed up our appetizer order the last time we were there, but owned up to it and made it up in spades. We had the Rodeo pizza. Soooo good! When the weather is nice, the patio is very comfortable. Highly recommended! We have been here many times and have never been disappointed. The pizzas and salads are so fresh and original. The wine list is varied. 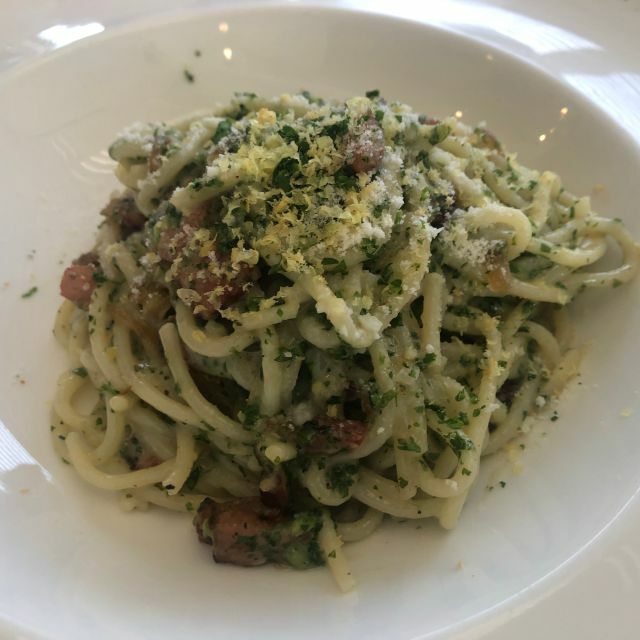 Our guests had pasta the last visit and raved about their choices. Our server this time was hilarious and very attentive. Highly recommended place to dine. Our favourite. PZA always gives me nostalgia for the old Stromboli's in Kensington. 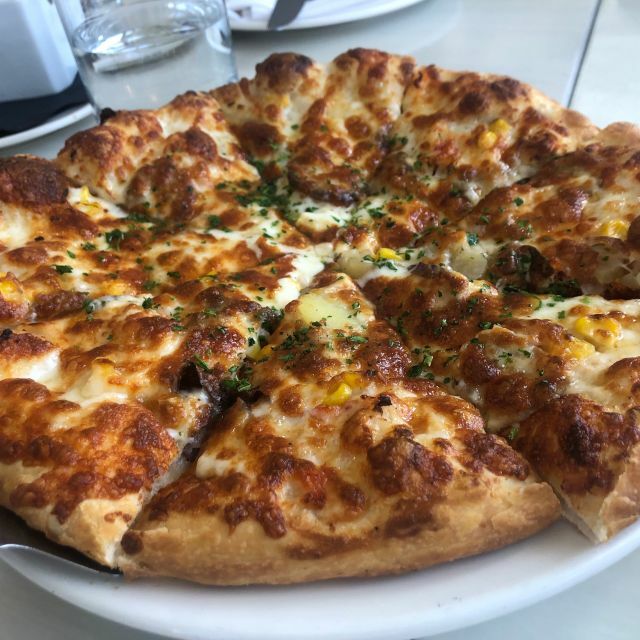 I think my favourite item is the pizza; I've had the entrees which are very good but the pizzas have such a great crust, hard to describe, almost flaky with a crisp but not too crisp bite. When we crave New York style pizza we always choose PZA. Service is always solicitous and thoughtful. The only thing is the chairs are not very comfortable , but in the summer we choose the patio, which is much more comfortable seating. Also love the fact there is plenty of parking nearby, especially during the deep freezes of winter. The service was great. It wasn’t too busy as the weather was bad. The pizza was the best I’ve had in a very long time! I even bought some pizzas to take home! I would definitely go back! As a celiac, this is the best gluten free crust I’ve ever had! Handmade, light and delicious. Moderately priced. Would definitely return. Great Pizza. Unique topping or can just stick to your favorite toppings. Homemade pasta and sauces which were delish. Awesome pizza! Had the daily special and the not so vegan. Both were very tasty and plenty to go around. We also had the red wine sangria which was very good. Not too sweet and the staff were able to accommodate all our requests. First time at PZA Parlour, and the food was very tasty, but I felt the Gnocchi plate was a little small for my big appetite! The pizza was amazing, very good size for one person. The ambience is very pleasant, the lights on the roof and the other decorations are very romantic. Prices are not cheap but not overly expensive, I'd say its premium casual dining. Service was great! Will definitely come back. My favourite Italian restaurant to bring my friends, or family to. Great food, the ambiance is incredible & the staff are always so friendly. The chilli oil is delicious! All of the pizza’s are amazing, and the specials are great too! It was not too busy the night we went and out service was excellent. Food was good, we tried three different pizzas and an arancini appetizer. The appt was good but could use even more flavour in the tomato sauce and maybe just a little less breading but still good. Some pizzas I liked better (the one with more meat). Loved the decor and ambience except for the metal chairs at most tables.....very uncomfortable. Simple thing to change. We love PZA. The kids love it, the parents love it and the grandparents love it. We will be back! Tried an entree instead of pizza this time and it was good. Service was adequate but not overly friendly. Food and service was fast and efficient. This place is a go to for me when I need a fast, tasty, cheat meal. With the entree I had, I really didn’t have a cheat which is good! Enjoyable and good value. Delicious pizza toppings and crust. We regularly go to PZA Parlour as it is easily one of our favourite restaurants in Calgary. This night we brought some friends with us as after us talking up PZA so much, they wanted to try it with us. The crew at PZA did not disappoint. The food and service were top notch and I still swear the Alfredo is the best I have ever had. You will be disappointed. The service was not great and at 530 pm with only one other table seated our food took an hour. Thankfully the food was really good but likely wouldn’t return because of the wait. Great!!! We go every year at Christmas time with my kids and gr kids and appreciate the awesome service great food and the private area you set up for us in the back. We were sat beside a drunken office party group that had moved from the private area to beside the bar. Other patrons to us the group were louder and larger before our arrival. Seating us elsewhere would have been the smart things to do. The group was loud and often using fowl language with no admonishment from staff. I hyped up this place to my visiting family. They left disappointed. We are sorry for any profanity and excessive noise. If any of our customers were offended then we extend our sincerest apologies. When a 65-head Christmas party is having more fun than anticipated there is only so much we can do, however we are working towards smoother transitions between large parties and regular dinner service. As this is not a regular occurrence we hope to see you again in the future. Please ask for Tony as he is around most nights and would love the opportunity to meet you. When we went there was a Christmas party that had just poured into the main dining area. There was lots of yelling, and profanity. The food took over an hour to get to our table, and even then their was mistakes to the orders. Refills on our drinks were missed and the place wasn’t 1/4 full. We are truly sorry for any profanity and wait times that you experienced. If any of our customers were offended then we extend our sincerest apologies. When there is a 65+ person Christmas party coming to a close there is only so much we can do, however we are working towards smoothing out the transitions between large parties and regular dinner service. Thank you very much for your patience and we hope an experience like this will not happen again. The food and service is great. Definitely recommend it if you are looking for a good Italian food. The salads are pizza are a must. Always a great place to catch up with friends! We had the bruschetta, Caprino salad and Super Fun Ghi pizza and all were excellent. The cocktails are creative but pricey (hence the review is not a perfect score), so we opted for wine.